RC airplane flying tips and how to prevent a crash. Crashing is part of the hobby. Everyone crashes, it’s just part of flying. After breaking my first plane, I swore it was impossible to fly and thought it would cost me 1000’s of dollars in wrecked planes to successfully learn. I practiced on flight simulators and watched other people fly but that wasn’t enough. I put together everything I wish I knew before starting to fly to hopefully help out beginner pilots. My biggest mistake was learning on the wrong plane. I should have started out with a 3 channel slow park flier. Instead I went straight for the high speed spitfire war-bird and completely destroyed it on take-off. Below is a list that I put together that covers the main reasons people crash and how to avoid it. If you have any questions or would like to add to the list, please leave a comment below. 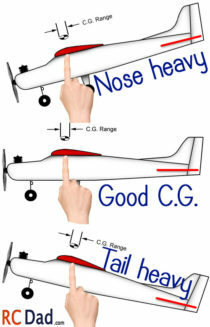 If you’ve even flown a real airplane, you’ll know that pilots take CG VERY seriously. A bad CG can make any plane extremely difficult or even impossible to fly. CG can even be adjusted for weather conditions to make flying easier. It depends a lot of the airplane, but generally a little nose heavy CG will help a plane fly more stable in windy conditions. Adding more weight to the whole airplane will also help smooth out flight in wind. The most dangerous CG is aft CG or a tail heavy airplane. This will cause your plane to constantly want to nose up and stall. Nose up take off might not be a problem, but when you come to land with a tail heavy CG and you’re in for a rough touch down! Even if you buy a RTF airplane, it might not be balanced for flight right out of the box. Most airplanes will come with a manufacturers recommended CG. 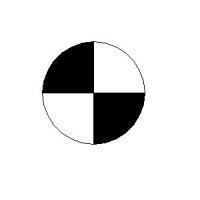 A quick and easy way to measure it would be to place your finger tips under the wings, where you see the black and white circle (symbol for center of gravity)in your manual. It looks cool but 9 out of 10 of my crashes could have been avoided if I just keep my plane up higher. This is especially important when you’re learning to fly or when you’re learning to fly a different model! It’s tempting to fly low and show off your shiny new plane but don’t, unless you have a very slow flying plane that doesn’t stall easily. You’ll want to trim up high as well, that way you’ll have more room to correct when you let off the controls for the second it takes to get trimmed out. Every plane has it’s own unique flight characteristics. Stalls, slow flight, fast flight, aerobatics, and recovery should always be done high up until you’ve mastered the plane. Even then, I have my favorite planes that I’ll never fly low simply because I want them to be around for awhile. Know the direction of the wind. Taking off and landing into the wind will make flying much easier! Even a slight breeze of 1-2 mph can make or break a landing. Also remember that the higher up you fly the stronger the winds get! An easy way to do this is to attach a ribbon to your transmitter or simply pick up some dirt/grass and watch it fall. Turning from upwind to a downwind will also cause a loss of momentum, leading to a drop in altitude and/or speed so be careful if you’re low to the ground. Map out your airspace in your head. In your head, map out your flying area. Close your eyes and point to trees, poles, buildings, or anything else that you can run into. The reason for this is to give you time to avoid hitting things, this sounds obvious but most people fly with tunnel vision. You’re so focused on your plane (especially fast ones) that all surroundings are not visible. Areas to turn. (clear things that you can hit) The faster you fly, the wider the turn so allow plenty of room. Take off and landing. Jets will need more runway for roll-out and touchdown. Plenty of room for approach. Look for a spot to fly far out for final approach so you can have time to get the jet under control and set up for a smooth landing. The majority of war birds were designed to be flown fast and to be aerobatic for dog fighting. This makes them unstable and easy to stall at lower speeds. One thing that was hard for me to overcome is the high torque of the propellers causing the plane to veer off to the left during take off. If you’re expecting it, it’s not that big of a deal but if you’re still new to flying it will cause a lot of pilots to over correct causing the plane to stall and crash. To fix this, simply do a longer roll out. Gain more speed before lifting the nose up and add a little right turn (and right rudder). Also expect the plane to veer off slightly to the left so make sure you’re clear of objects in case of sudden turns.